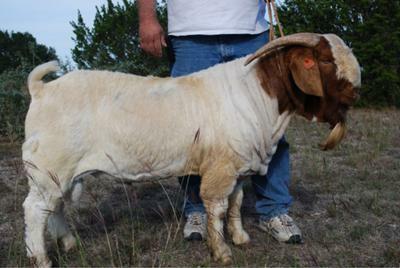 This is a directory of Texas-boer-goat and if you wish to add your details or change details then please use the Directory Form. If you wish to exchange links then also advise me, it helps both our sites in the search engines. If you wish to list a few details of your goat farm and breeding enterprise or donate an article on goat care or goat raising. Keep to 100 words or less for farm details and 400 words for articles then please send it to me using the Directory Listing Form. Happy Creek Boer Goats - Linda and Darrell Blumich; Goliad, Tx; www.happycreekboergoats.com; 361-645-4756 or 361-645-4893. Owens Boer Goat Ranch - We are a small farm where quality is our main focus - It cost just as much to feed a good one and a not so good. But it does take time and Money to get to where you want to be, so it is a work in progress. You are welcome to come and visit us in Houston Livestock show and Rodeo annually - We are happy to talk to folks especially the new exibitors that and share information. We sell show quality wethers, doelings, and Bucklings and occasionally we will cull a few does- My herd has been tested for CL and CAE and is clean so far. Our kids are born from Feb until June. Feel free to contact us 936-372-2736 or email stoney7mm@yahoo.com and come visit. Cottonwood Creek Farm - Raising quality Full Blood, South Afican and Codi/Pci breeding and show stock. Black, red , paint and traditional with some of the best genetics in the Boer Goat Industry. L & L Boer Goats Dayton - We are a small farm with a select bloodline. My goats originally came by way of John and Patsy Blair of San Angelo, Texas. I have Prince Duke who is the great grandson of Mojo Magic with other ennoblements such as Kaptein on his pedigree. 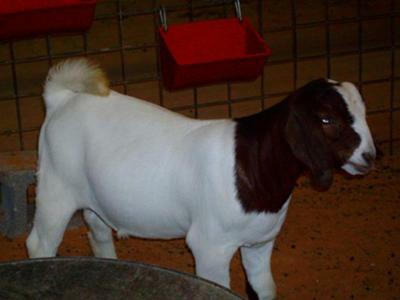 I sell a few fullblood herd sires each year and a few show goats as well. Once in awhile I sell off some does to be replaced to keep new blood infused in my herd. I have a very rigorous worming program that works and I stay on top of treatment for preventing Coccidiosis. I have vaccinated and continue to do so once a year to prevent getting CL in my herd, I use the Case-Bac California Serum with good results so far. If anyone is interested in selling or buying feel free to contact me with the information. Thanks for your time. Linda and Darrell Blumich; Goliad, Tx; www.happycreekboergoats.com; 361-645-4756 or 361-645-4893.